The Deepwater Horizon oil spill unfortunately is still leaking crude oil into the environment. Despite the best effort of several companies, our government and individuals, the oil spill has yet to be stopped. The “top kill“, a method where a drilling solution (called “mud”) was pumped down into the well to overpower the pressure of the crude oil, was tried 3 times before it was considered a failure. It is the same effect as using water to stop Coca-Cola from coming out of a shaken bottle. If the water has enough pressure it can overcome the pressure of the Coca-Cola, and keep the soda in the bottle. Then the cap containment system was tried. 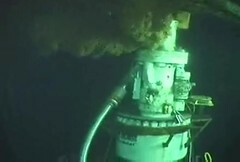 It involves removing the damaged pipes above the blow out preventer. A new pipe can then be connected to the old pipe allowing the oil to be collected by the Drillship Discoverer Enterprise (no not that one, or that one either). All the pipe cutting, sealing, and maneuvering is being done under water and using Remotely Operated Vehicles (check out my previous blog). They first tried to cut the pipe using ROVs with a diamond tipped saw. Unfortunately the saw became snagged and they had to use a shear, a large device that come form the top to grip down on the pipe, tear away the rest of the pipe, making a jagged edge. The more jagged the edge the harder it is to fit the new pipe so that no oil leaks out. This cap has been placed and it has been taking away some of the crude oil. Every day it takes more and more up to Discoverer Enterprise, but it has not fully contained the leak. Relief wells are still being drilled on two sides of the well. These will open up a different path for the pressure to take, hopefully allowing the main well to be sealed. While this is still the mostly likely way to stop any oil from leaking into the ocean, it will take 2 more months to complete. Louisiana is creating artificial sand bars to stop the oil from washing up into the wetlands. There has been some controversy over these. They will move massive amounts of sand to form small artificial sandbars and prevent the oil from coming into the wetlands. The oil would wash up on the artificial sandbars and then could be collected and removed from the area. Scientist are concerned that there may be unforeseen environmental damage done by creating these artificial sandbars. They do not want to act too rashly in the short term and cause more environmental damage in the long run, like the environmental damage done by dispersants that were used in the clean up of the Exxon Valdez oil spill. How can you help? There are a number of different national and state organizations have geared up meet this challenge. Here are few.